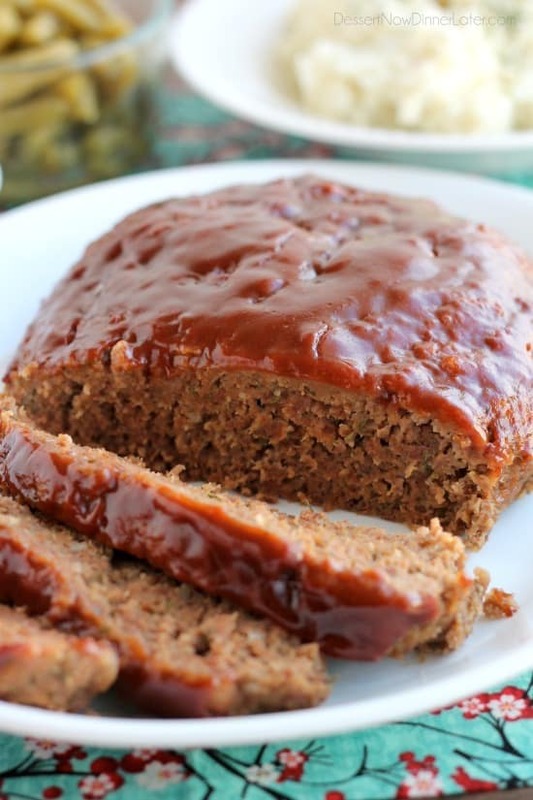 Slow Cooker Meatloaf (+ Video) - Dessert Now, Dinner Later! 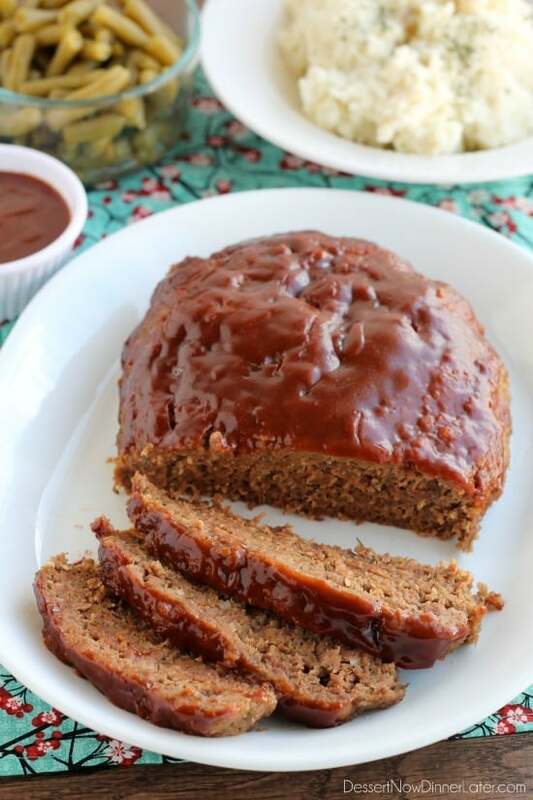 This Slow Cooker Meatloaf has a delicious savory-sweet brown sugar and balsamic glaze on top, and is cooked on a sheet of parchment paper that easily lifts the meatloaf out of the slow cooker when it’s done cooking. 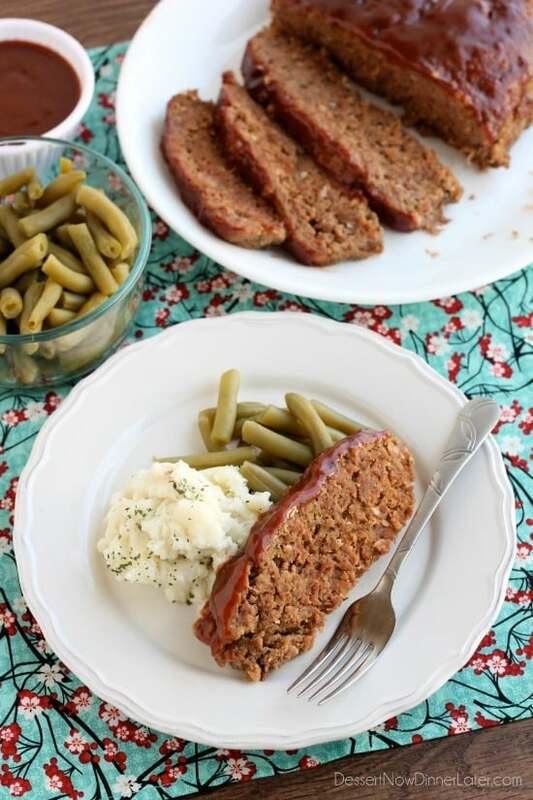 I saw this slow cooker meatloaf on my friend Kelly’s blog and made it one Sunday, swapping a few things for ingredients I had on hand, and it turned out so amazing, that we made it again and I HAD to share it! Our favorite things about this meal is that: 1) It’s made in a slow cooker. I mean it’s SO easy and perfect to have cooking while you are in church. 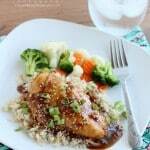 2) We love the balsamic glaze on top! It’s like barbecue sauce, but better! 3) If you put parchment paper in your slow cooker, you can lift it out and literally have NO CLEANUP besides your dishes to prep it! 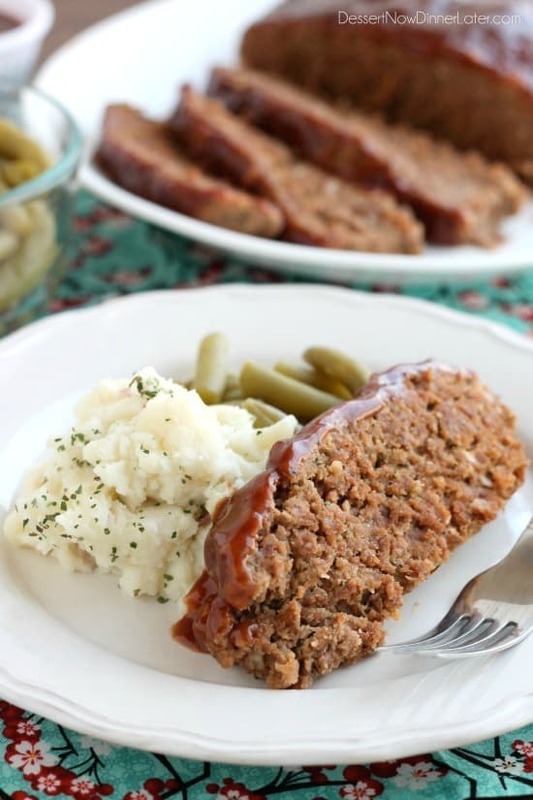 Definitely put this slow cooker meatloaf on your upcoming menu! You’ll be glad you did! In a large bowl whisk the eggs and milk together. Then add the ketchup, mustard, hot sauce, brown sugar, parsley, thyme, salt, pepper, onions, garlic, and bread crumbs. Add meat and mix with your hands until it forms a loaf. You may need an additional ¼ cup bread crumbs, but just enough to form a loaf; the meat should still be moist to the touch. Line a 4 QT slow cooker with parchment paper. Lay loaf on the parchment paper, flattening slightly and shaping it so that everything cooks evenly. Prepare sauce by whisking all ingredients together. Spoon half the sauce over the top of the meatloaf. Do not contaminate the other half of the sauce with raw meat, so you can use it for extra dipping sauce. Cover and refrigerate the extra sauce. Tuck the parchment paper inside the lid of the slow cooker and cook on low for 3 to 3½ hours until the internal temperature of the meat is 155 degrees Fahrenheit in the thickest section. Pull meat out of the slow cooker with the parchment paper. Slice and serve with the extra refrigerated sauce (you may heat it up in the microwave if you like). 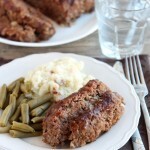 Slow-cooked meatloaf is definitely something I need to hop onboard with! 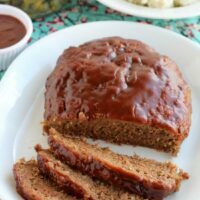 It sounds so easy and I’ll be the texture of the meatloaf is so moist and amazing! Love the glaze on this! You have to try it! So yummy and easy cleanup if you use parchment to lift it out! We love meatloaf but hardly ever eat it. 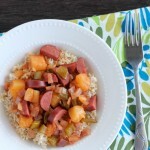 I love this slow cooker version. It’s enticing enough to make me want to make it! Every time we finally make it, I’m like, ” Why don’t I make this more often!” Haha. It’s good, it’s just not one of those meals that I remember to make on a regular basis. I’ve made it twice now! Your recipe was a good one to go off of with what I had at home! Thanks Kelly! If I doubled the recipe, would i need to extend the cooking time? Yes, I am thinking you would have to increase the time a minimum of 1 hour longer. Can I use aluminum foil instead of parchment paper? I have everything else at hand except for that. Do you think it would change how it cooks? If it’s heavy duty foil, you should be just fine. If it’s thin, cheap foil, probably not because it might tear instead of lift right out. You can do it without a liner altogether and just put a little bit of cooking spray on the inside, but it’s tricky to get the meatloaf out in one piece. You may have to cut in in half and remove one half at a time. I hope you find a solution that works for you! Enjoy! I would advise against using aluminum foil in this, due to the acidity of the ingredients and the cooking time. Aluminum is a reactive metal and when used cooking with acidic food will react with it and start to leach out into the food. 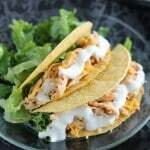 I have been a professional chef for almost 12 years and food safety is my number one concern! Thanks for the great recipe btw!! Good point! Thanks for the caution! Do you still put a little water in the crock pot or just the parchment paper? I’ve only ever done plain parchment paper, no water. Enjoy! Do you think you can freeze this loaf and sauce separately? And then bake it later? I don’t see why not. If you try it, let us know how it works out! Awesome! Thanks for your comment! Followed all the directions – except I’m creating with ground turkey. I’m excited !! Just made this for dinner tonight and it was delicious! My husband loved it! Will definitely be making this again. Glad to hear it! Thanks for your comment Molly! This has become my “go to” meatloaf. Turns out amazing every time, so its on a regular rotation. Thank you for sharing your recipe. I’m so glad to hear that Terry! Thanks for your comment! Would this work in the oven? Love the flavor but want it in the oven. Amy suggestion on temp and time? It would take about 45 minutes to an hour at 350 degrees Fahrenheit. Use a meat thermometer to check the thickest part of the loaf. It should be 155 degrees for ground beef. Mine ended up tasting very “oniony” nothing like what I think of as meatloaf, spices are very off. Is it supposed to taste like this or did I do something wrong? Hi Caitlyn. I’m sorry this meatloaf wasn’t for your tastes. We quite enjoy it and have it at least once a month. It is different than a “traditional” meatloaf though. Feel free to use your favorite meatloaf recipe in the future. It should cook about the same amount of time in the slow cooker. How long should I leave it In the slow cooker if I put it on high? Not totally sure how it will do on high. I would start checking the internal temperature around the 1 hour mark. You want it to be 160 degrees Fahrenheit in the thickest section. It may take up to 1 1/2 hours, but that’s a guess.